The Contemporary Art, Design and New Media Art Histories (CADN) MA program at OCAD University is pleased to announce a Call for Submissions for projects and papers for the upcoming conference Multiple Li(v)es of Art/ists &..., scheduled for Spring 2015 in Toronto, Canada. Multiple Li(v)es of Art/ists &... seeks to investigate projects that actively destabilize binaries, permeate borders, and foster interdisciplinary engagement to trouble the transitory spaces that condition contemporary society. 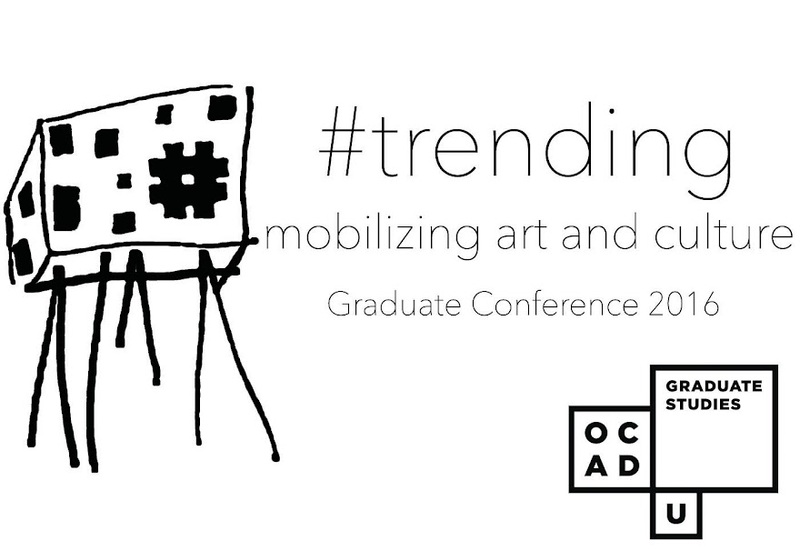 This conference aims to address ways art (or Art) and its many disciplinary iterations continue to morph and change. By providing an armature onto which scholars and artists might graft semblances of understandings gained through the ex/interchange of knowledge and ideas, the conference leverages productive energies of discourse and critique to tease out the questions which necessarily accompany exploration of the contemporary. Applicants are invited to consider the ways in which the act of making has become synonymous with fluidity, adaptability, and amalgamation. This conference foregrounds particular interest in themes such as hybridity, in-betweenness, deconstruction, interchangeability, decolonisation, borderlands, liminal space, trans-disciplinarianism and queerisms as they apply to the production, distribution and reception of artworks. How do we upset binaries or combine forces/concepts/practices in new or hybridized ways? How has the collapsing of binary understandings challenged artistic production in both institutions and in the public sphere? How does Art as an apparatus or medium in-and-of-itself provide opportunities to activate processes that are never complete and remain unfinished? What or who is an artist in light of questioning the boundaries of art? How do we talk about art as a dematerialized process, reliant on context? How does writing about art rematerialize art? Where does art fit in relation to other disciplines? What is the interstitial space between artist and scholar, artist and critic, artist and curator, artist and archivist? How can we negotiate fields/sites of production such as popular vs avant garde, artist as researcher, curator as artist? How is experimentation across media productive in art and cultural criticism? The conference will be structured to include panel presentations (15-20 minutes), roundtable discussions (60 minutes), workshops (90-120 minutes), academic poster presentations, and an accompanying installation or performance art exhibition. There is a special publishing opportunity available post-conference, see below for more details. Applications are welcomed from scholars, artists, curators, collectives, critics, and post-secondary students of all levels and backgrounds. All applicants are eligible for selection for panel presentations as well as roundtable discussions and poster presentations. Successful applicants may also be invited to submit their papers for publication in a special issue of Kapsula Magazine. If you are interested in this opportunity you must submit your paper to the Conference Committee by February 20, 2015 in order to be included in Kapsula Magazine. Participants in conference workshops or roundtables may be invited to produce a piece of collaborative documentation of the specific event for Kapsula Magazine. If you have any questions feel free to post in the comments below.